We had a great night out at the Magnolia Cafe, for the Dubbo BUG Christmas Party; great company, great food and lots of laughter, what more could you ask for! Thanks Bec, you did a fantastic job. Photos of our mixed terrain Narromine weekend, 31st October and 1 November 2015, the first day was a very wet day creating a challenging, fun ride. Day 2: blue skies, what a difference a day makes. Great fun had by all. Sunday 1st November, BUGs Sunday morning ride will change back to 8am start. We hope to see you this Sunday at Wahroonga Park in Healy Street, South Dubbo as usual, ready to leave at 8am for a social ride followed by a social coffee. Four members of Dubbo BUGs travelled to Italy last month (September 2015) to tackle some of the iconic climbs of the Giro d’Italia. Dave and Angela Bakac, Mick and Kerrie Cooper along with Paul Kerr and Brian Bell. 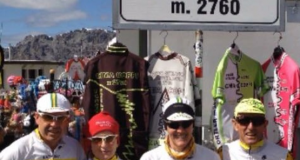 They cycled the Stelvio, Gavia and Mortirolo. We’re very excited to announce the launch of our new Dubbo BUG website and Facebook page. Please LIKE our Facebook page and spread the word! 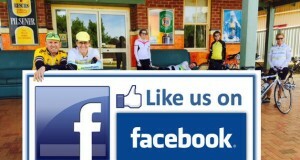 www.facebook.com/dubbobug Yep, the wheels are turning here at Dubbo BUGs! Stay tuned!